Very remiss of me, I concede, but I've just realized that we didn't have a 7A38-xxxx model specific topic for the 7A38-701A SAA003J. 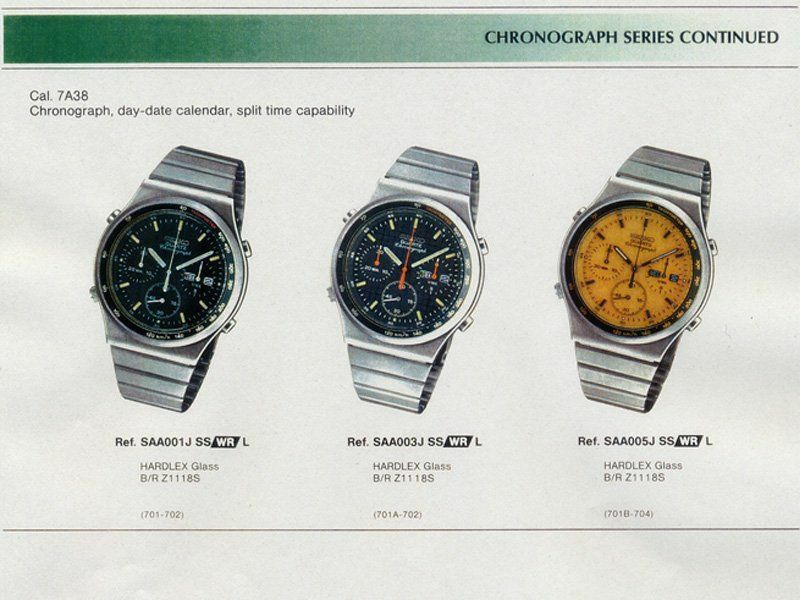 Possibly the rarest variant of the 7A38-701x model family (shown here in the middle of this 1983 group catalogue illustration). For reasons which will soon become apparent, I thought I ought to somewhat belatedly start writing one up - and a bit sharpish. 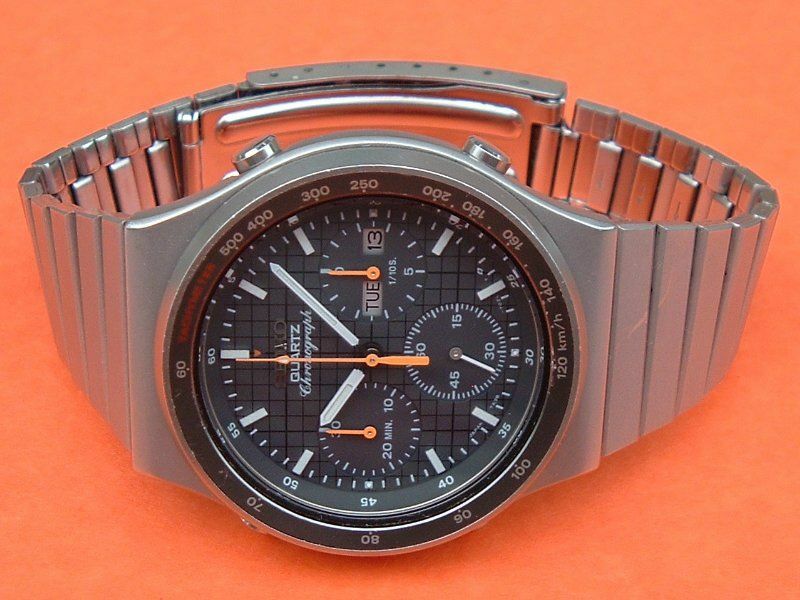 In fact, the cross-hatched dialed 7A38-701A appears to be nearly as scarce as it's yellow-faced 7A38-701B sibling. 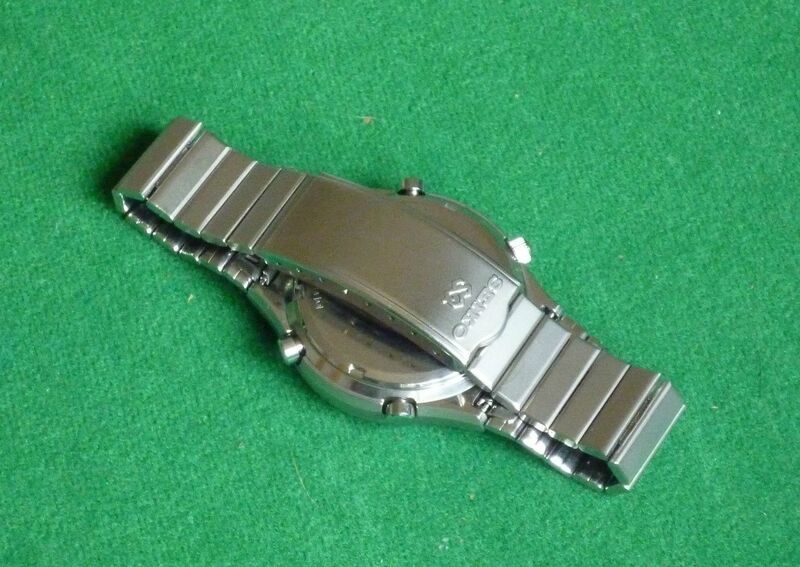 Now three years on, I'd suspect I've seen slightly more 7A38-701B 'Vulcan's for sale than I have 7A38-701A's. It's a close run thing. Probably one of the nicest examples belongs to Hung Pham ('Time2Fly' on SCWF). 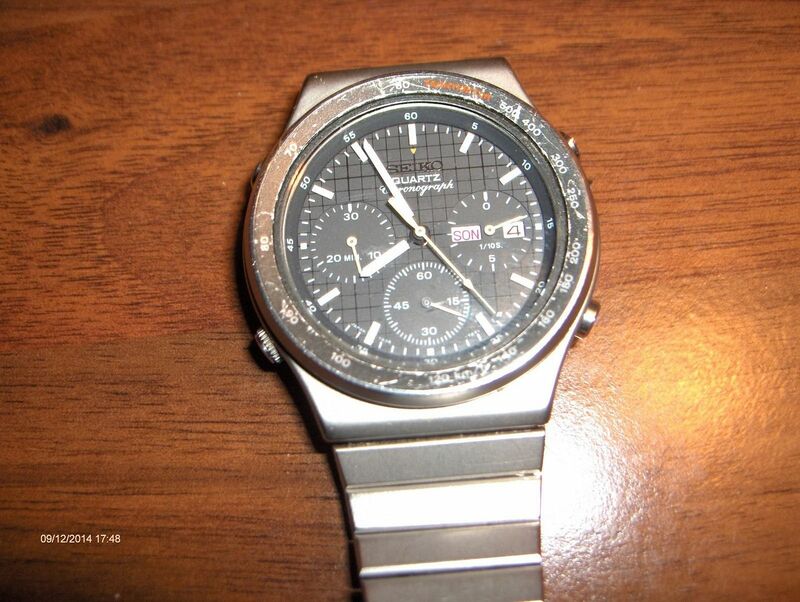 As I wrote in the eBay section's Yahoo Japan Auctions - Watching Watches thread earlier today; he's been at it for literally years. Reserved (for more past examples on eBay). To be completed later. Reserved (for photos of mine and Achim's). To be completed later. Apart from appearances in the WRUW thread and prior to belatedly starting this 7A38-xxxx model specific thread, there have been a couple of previous occasions where 7A38-701A's featured in threads on this forum - though not exactly for the best of reasons. It seems that everything sells eventually - if not quite for the seller's original inflated asking price. 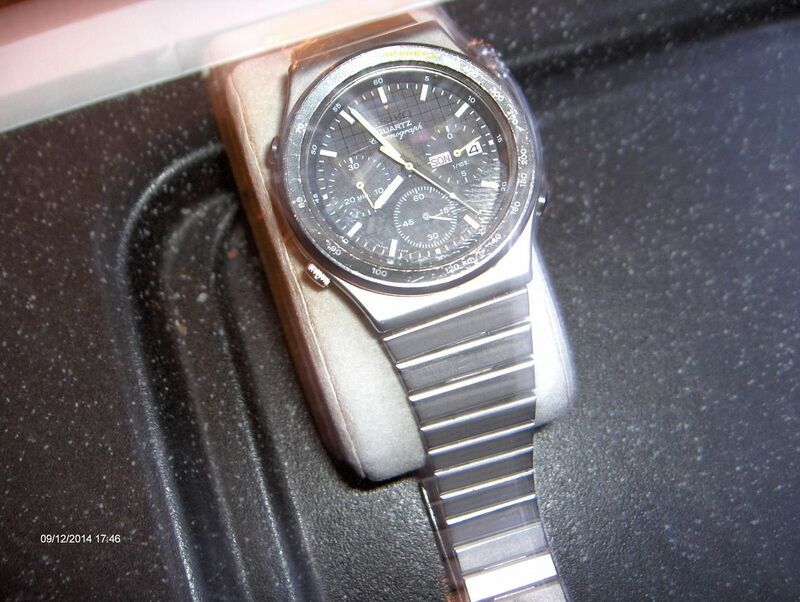 and I came across Strega_68's most recent listing for this suspect-looking 7A38-701A - which had ended a couple of weeks ago. 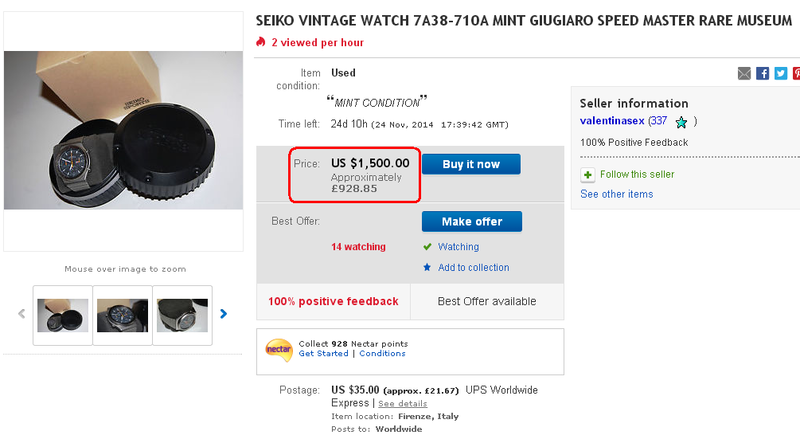 If that is to believed, it eventually sold against an offer of $514. We never did get to see a photo of the OP's old dial ring, quote: chapter ring is knackered it's not round anymore but square!! I think I may now have some idea what happened to the dial ring of the original RLT poster's 7A28-7120, and how it may have looked. 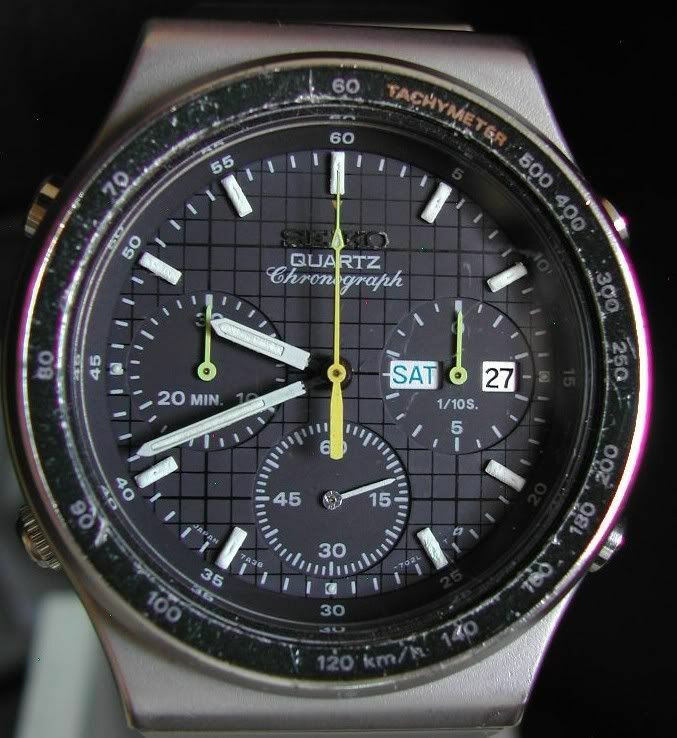 I was browsing the Italian Orologi & Passioni forum last night, catching up, reading a few recent 7A38 threads I'd missed. 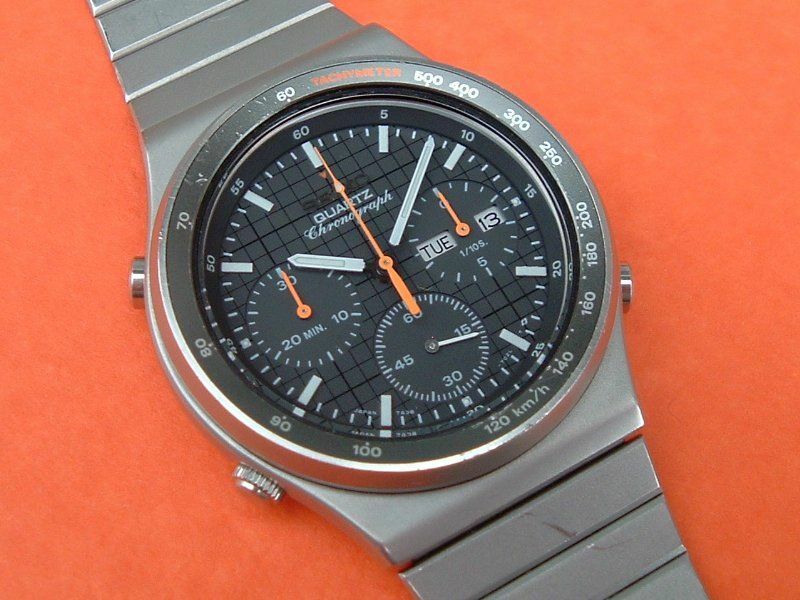 Found this one, posted a week ago: http://orologi.forumfree.it/?t=65757861 - about a rather tired looking 7A38-701A. 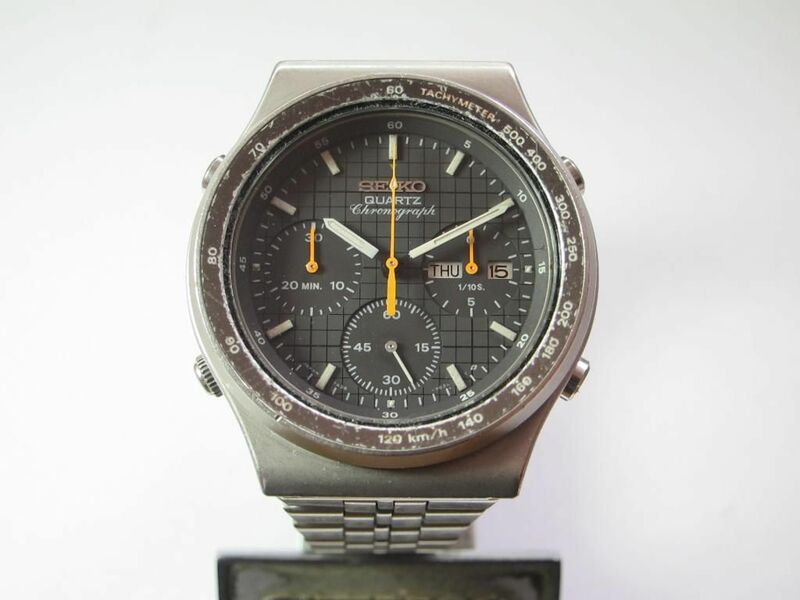 Ringrazio chi mi darà informazioni su questo Seiko 7A38, in quanto in rete non ho trovato niente circa la seconda parte della ref. 701A. Mi piacerebbe sapere se ha un certo interesse collezionistico, il significato della sigla [A3] dopo la referenza riportata sul fondello, se è facile o meno reperire un bracciale acciaio adatto, originale e coevo e magari un inserto ghiera in miglior stato. 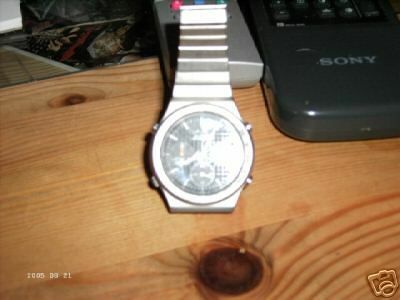 Look carefully at the minute ring ! It's no longer circular, but in places between the batons (which will have restricted its shrinkage), it has developed flat 'square' edges. In his reply, '6309 7040' (a.k.a. Manuel) wrote: Peccato per il rehaut deformato. Translates as: Too bad about the warped inner ring. Plastic, particularly old brittle thin plastic can warp of its own accord, but especially when subjected to heat. You have been warned. Looks like Total_Time22 is still at it. 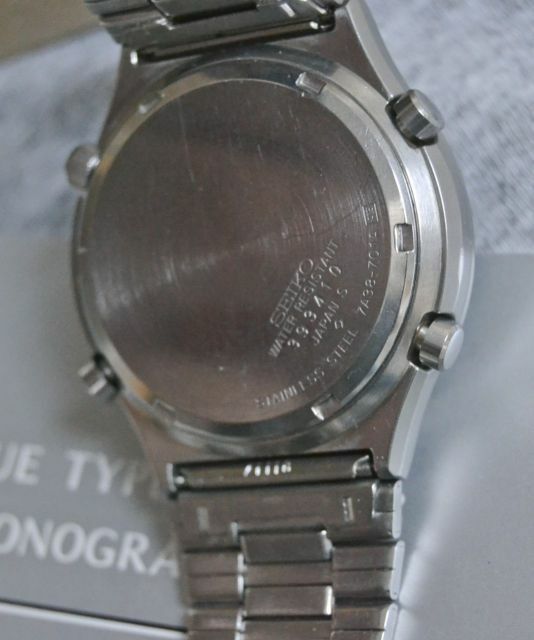 Even though there's no photo of the case-back, showing the serial number, in this new listing for a dog-eared 7A38-701A he created overnight, as soon as I saw it, I recognised the watch straight away - despite the fact it's now fitted with a different (incorrect) bracelet. 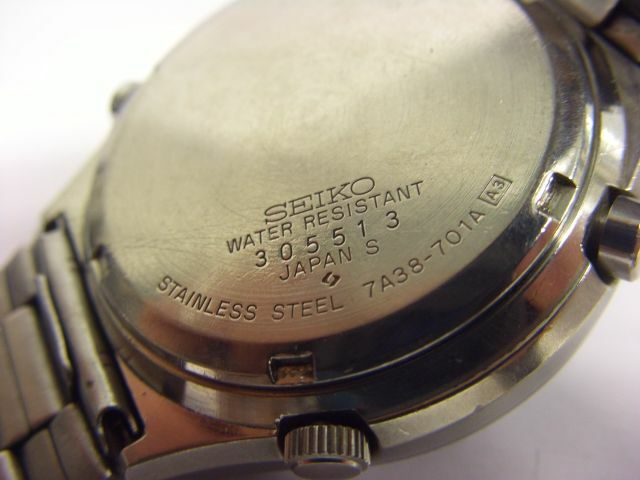 The ORIGINAL SEIKO VINTAGE STAINLESS STEEL BRACELET (from another model of the same era) appears to be a somewhat knackered (despite his description of it as being in VERY GOOD CONDITION WITHOUT ANY DENTS OR STRETCH) Seiko p/n Z1093C off a 7A48-7000 - but I haven't bothered to look that closely. 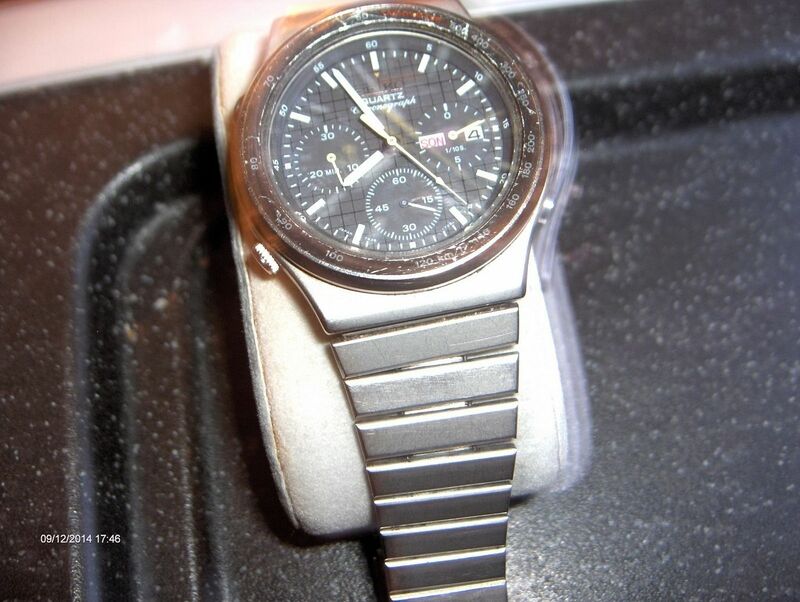 Total_time22 changed his 'modus operandi' last year (see my post above, dated May 16th) in that, like many eBay re-sellers, he now sometimes uses a different eBay ID for buying watches for resale. 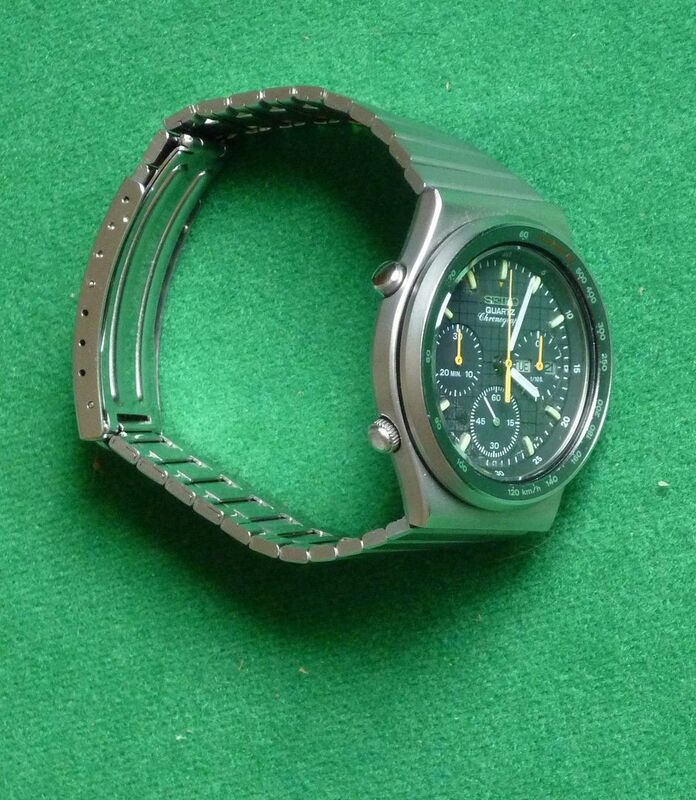 So how can I be so sure that this is the very same 7A38-701A ? 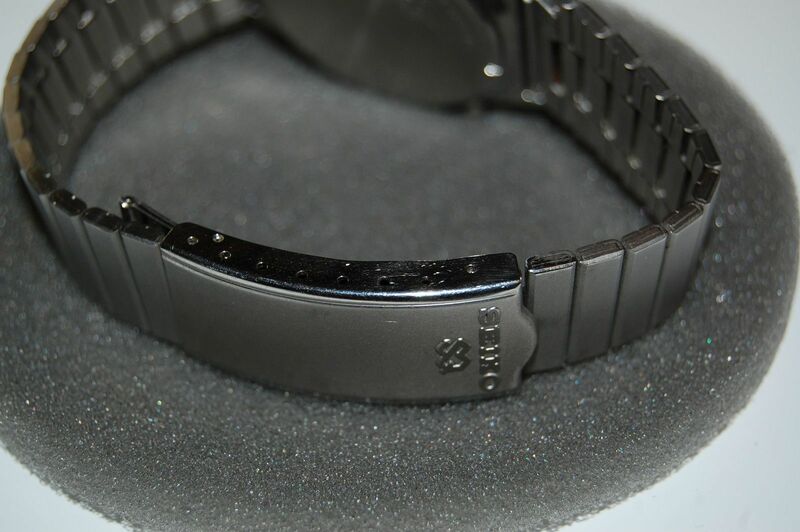 No serial number to compare (not in his photos); different bracelet now fitted and a different winning eBay ID to Total_time22. The other thing you've got to ask yourself is: why does Total_time22 actually bother ? He's got it up as a Buy-it-Now for $129.99 - but he paid $103.50 himself + $45 shipping. 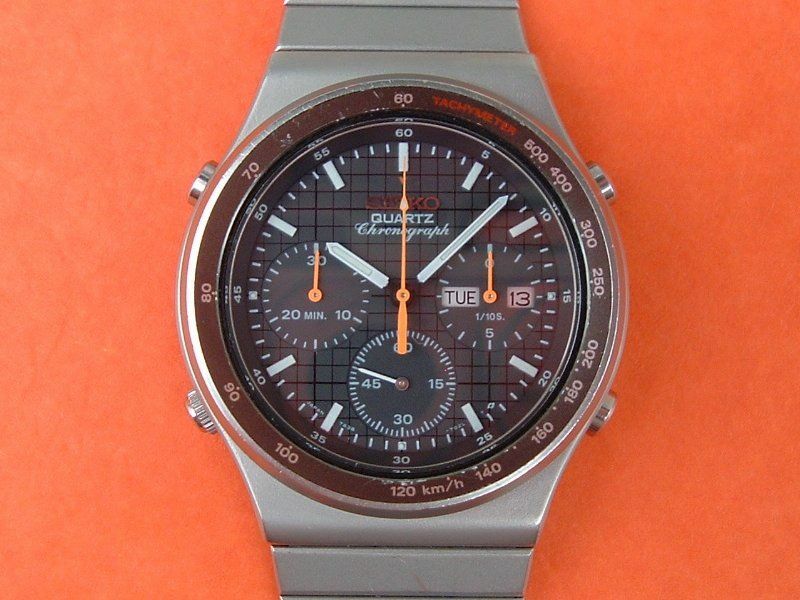 Once I've filled in the gaps in the preceding posts (over the next couple of days - I promise ) readers will hopefully soon be able to gather that sightings of half decent examples of the 7A38-701A on eBay - or for that matter any examples are few and far between. What prompted me to get this topic started pronto was the emergence on eBay Italy of what might at first appear to be a mint example. 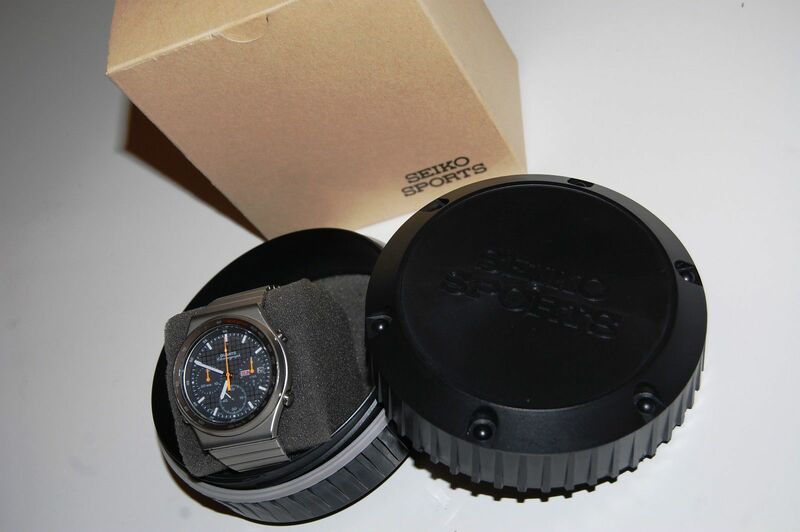 It was listed this evening by valentinasex - a.k.a eBay seller goffre78 - real name Alberto Ulmi. So naturally it's stupidly over-priced. Until you closely study his last photo. 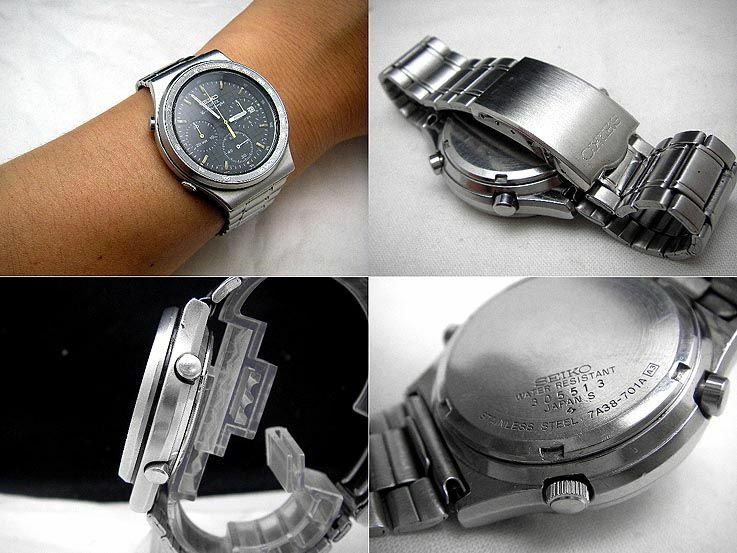 Is that rust around the 4 o'clock pusher and underneath the bracelet joining link plate ? Yesterday, Alberto has seen fit to increase the Buy-it-Now price from his original 'pie-in-the-sky' figure of $1200 to $1500 !! 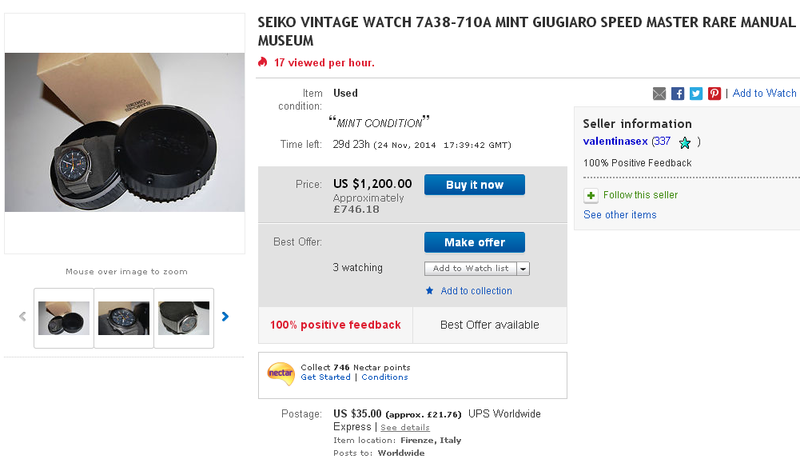 But if it is to be believed on this occasion .... Alberto's less than mint 7A38-701A sold for the equivalent of a whopping $725 !! Reserved (for Specifications and Buyer's Guide). To be completed later. 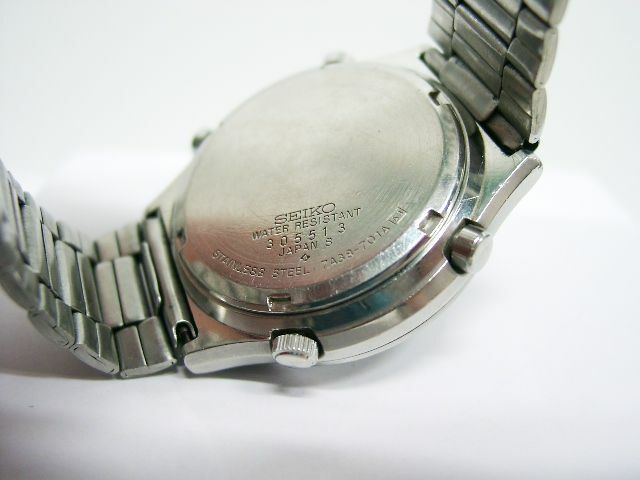 I'm sending this email concurrent with an email to Seiko USA and thought I would ask you for your thoughts as well. 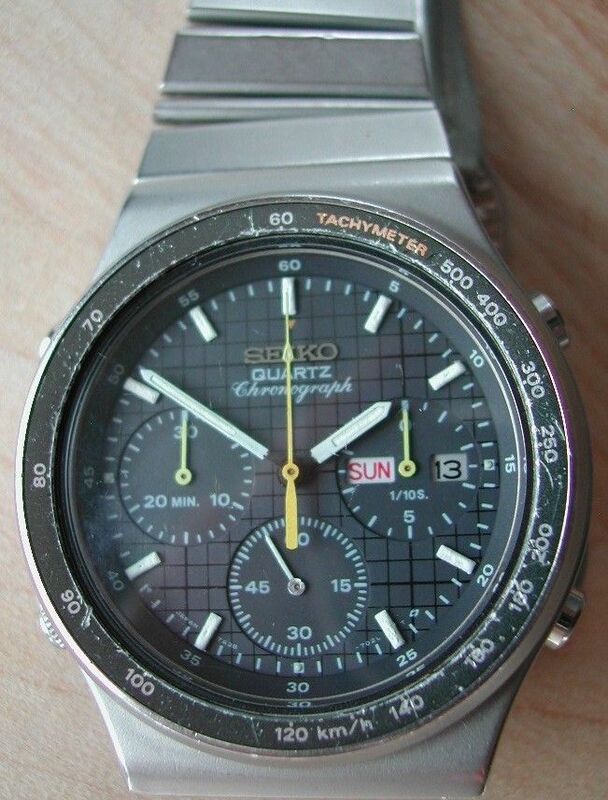 I am the original owner of a Seiko 7A38 701A quartz chronograph that I purchased via the Army and Air Force Exchange Service (AAFES) catalog while deployed overseas in the Atlantic and Mediterranean in the spring/summer of 1985. 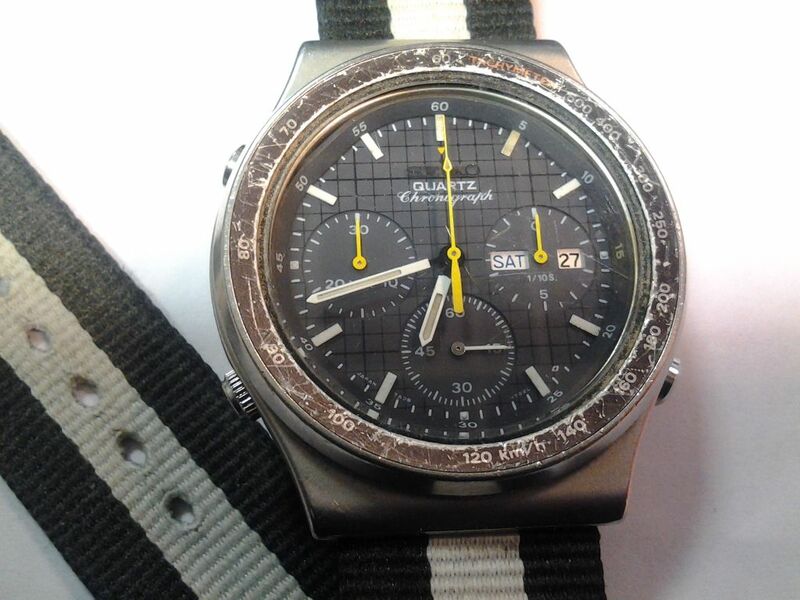 As a Naval Flight Officer from 1977 to 2007, this watch is one of three Seiko chronographs I own, the others being a black dial 6138 0040 "Bullhead" chronograph that I purchased new while deployed to Asia in 1979 and 1980, and a 7T34 6A09 "Flightmaster" quartz chronograph that my wife purchased for me new at a Navy Exchange in the 1990s. 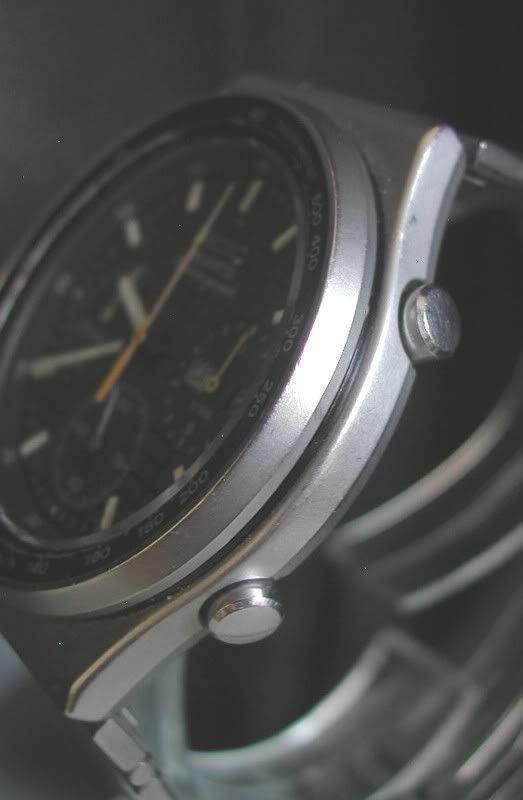 All three watches continue to function flawlessly as timepieces, and having flown high performance jet aircraft for three decades, all three have excelled for me in the cockpit. 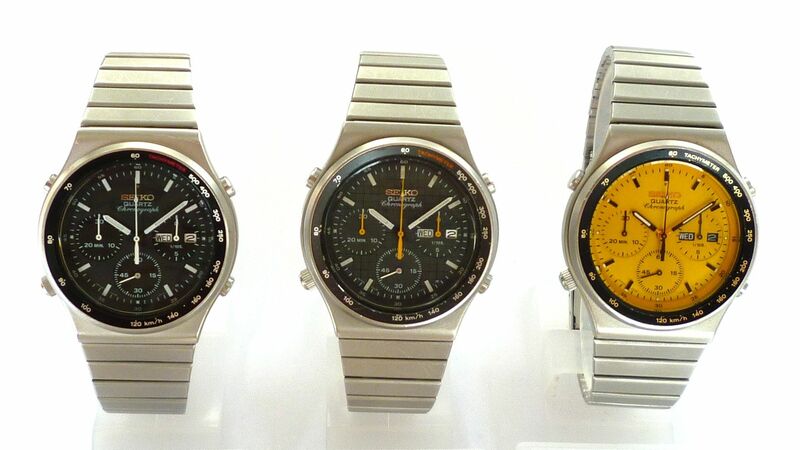 All three also have their original bands. 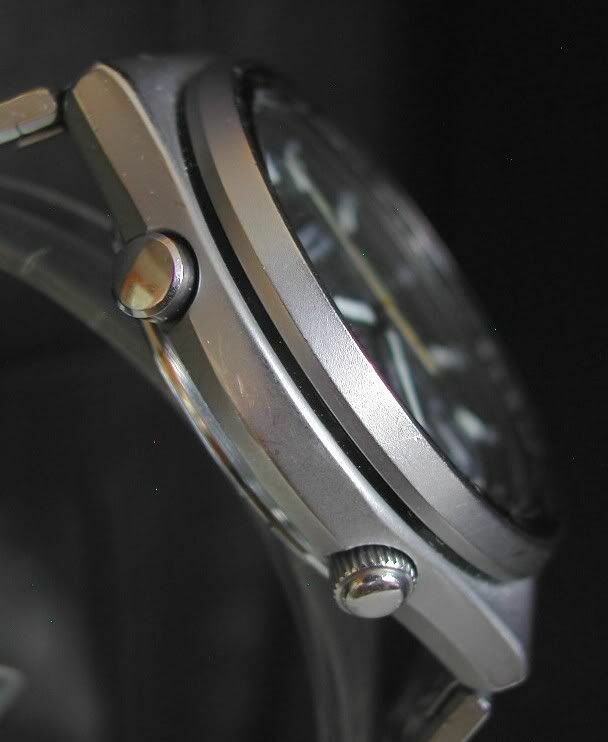 Last month, the watchband on the 7A38 701A failed, separating between the first and second links at the top of the watch. 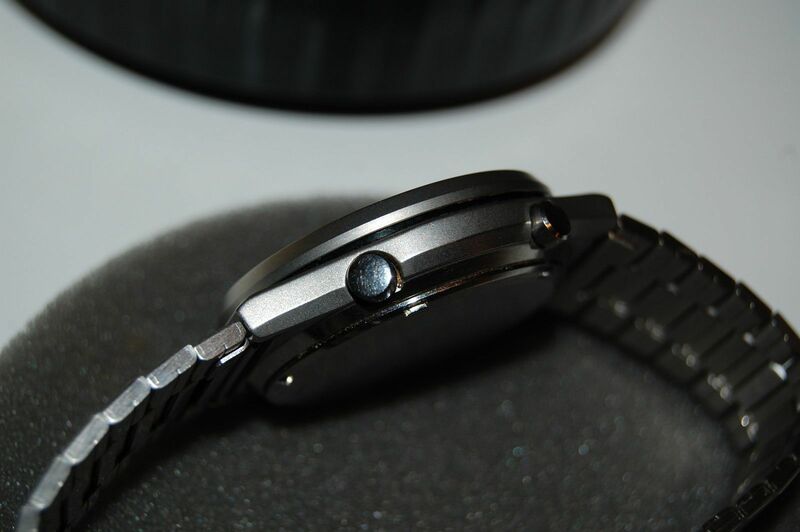 Taking the watch to our local jeweler (who has been in the business for nearly 30 years), the band was assessed as being unrepairable and that it likely failed simply due to age. 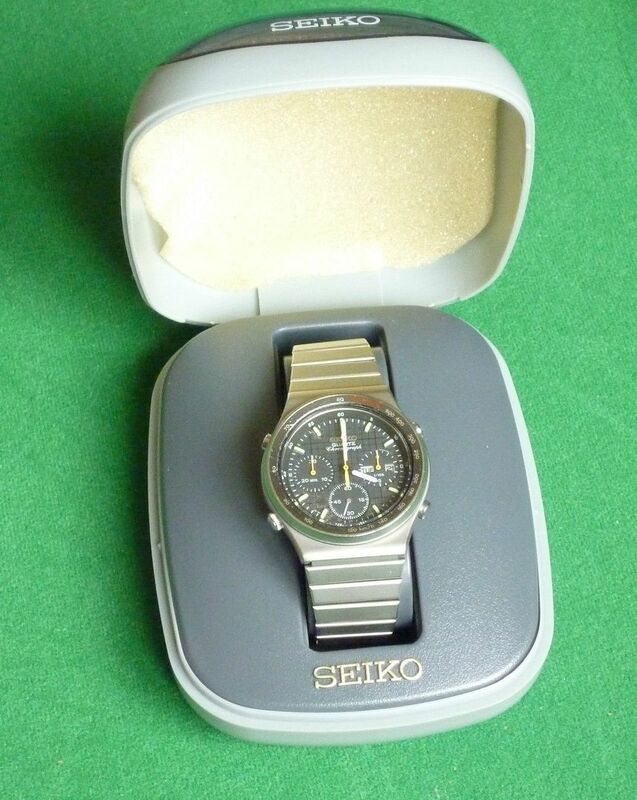 His recommendation was to contact Seiko for assistance. 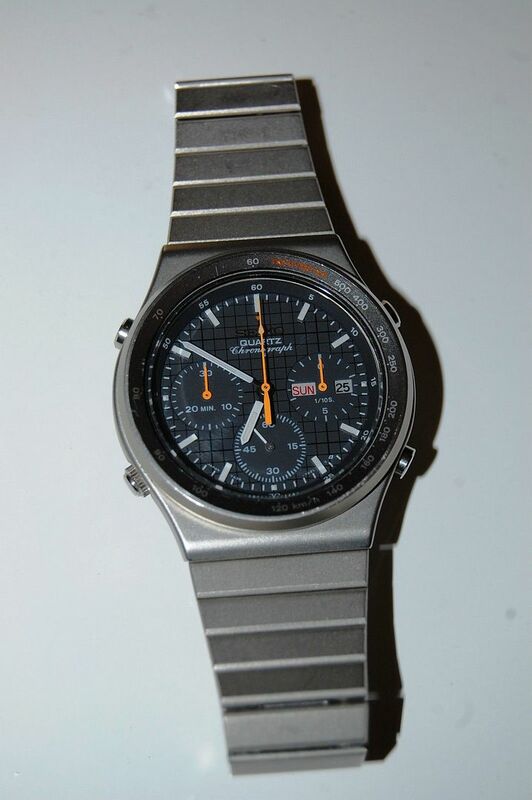 Realizing that this watch has probably been out of production since the late 1980s, I suspect that finding an exact duplicate of this particular bracelet band is unlikely. 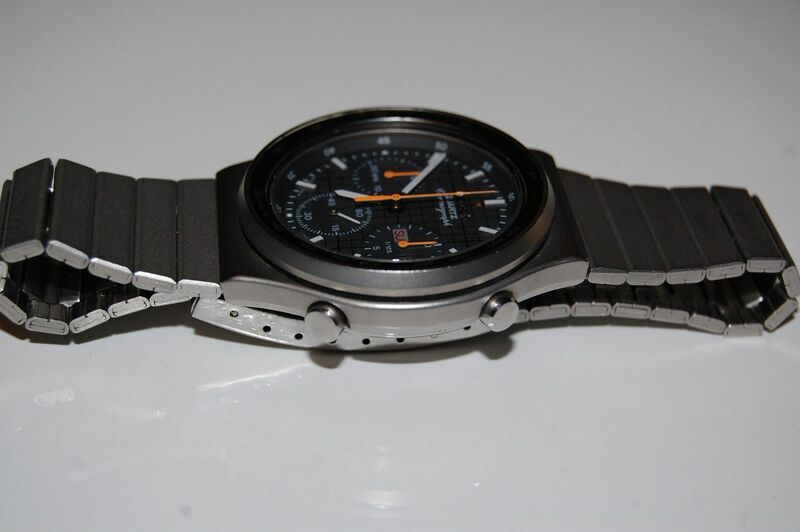 However, I don't wish to replace it with a non-Seiko aftermarket bracelet, preferring to stay with some sort of Seiko band. 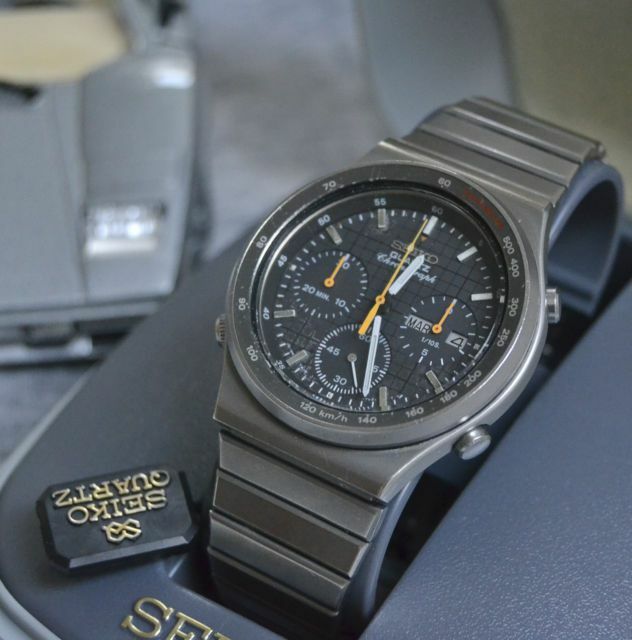 Complicating matters is the fact that the Seiko 7A38 701A quartz chronograph has, as you know, a somewhat unique silver satin finish. 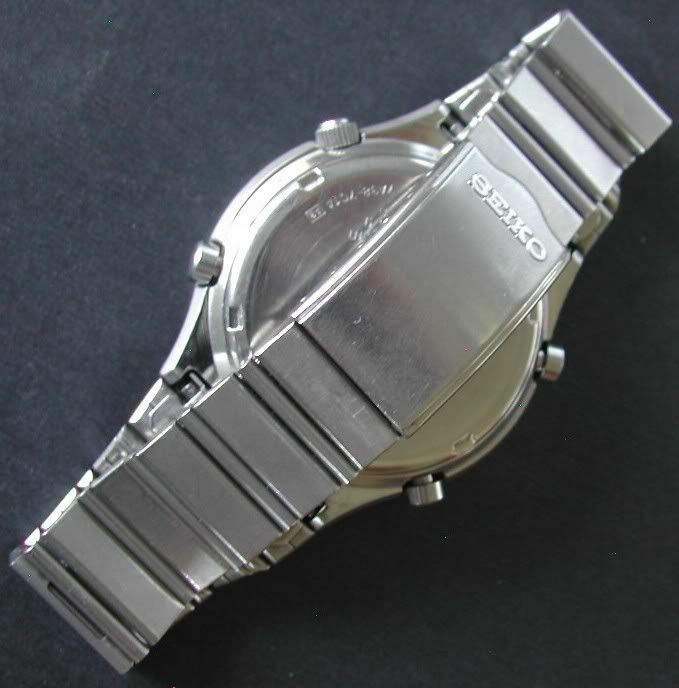 Research on the web has not yielded any results, so I was hoping you and/or your colleagues might be able to recommend some suitable Seiko watch band alternatives. Thanks for your email. Sorry, I don't have any simple solution for your dilemma. 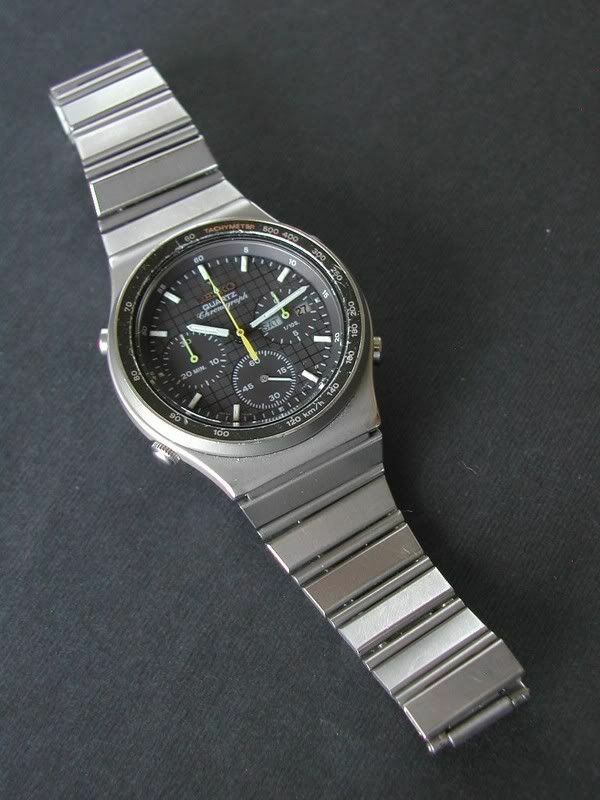 The Seiko p/n Z1118S bracelet is obsolete and no longer available. Their typical 80's lightweight folded link construction was a major weakness that usually lead to stretching of the U section joining pieces and early failure. 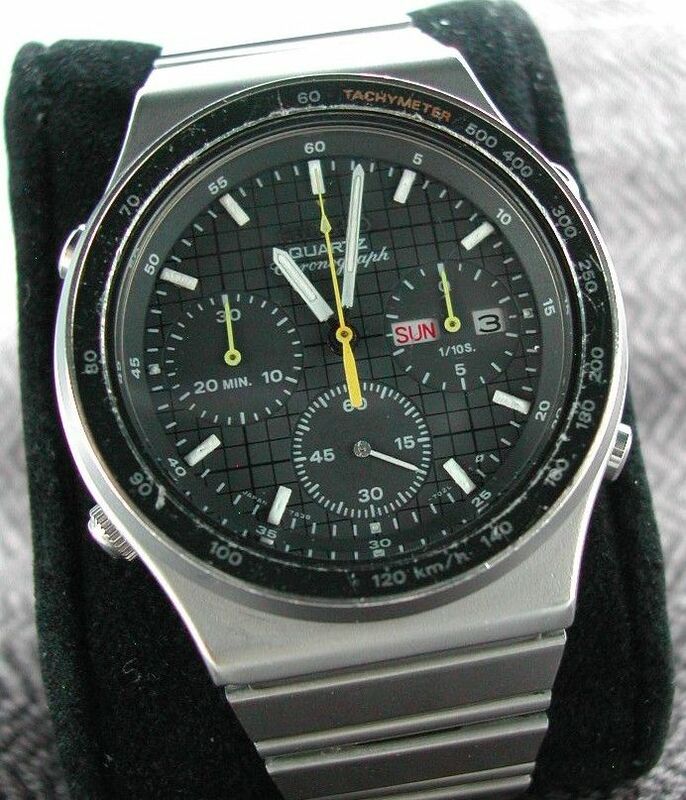 Seiko UK ran out of stock years ago. 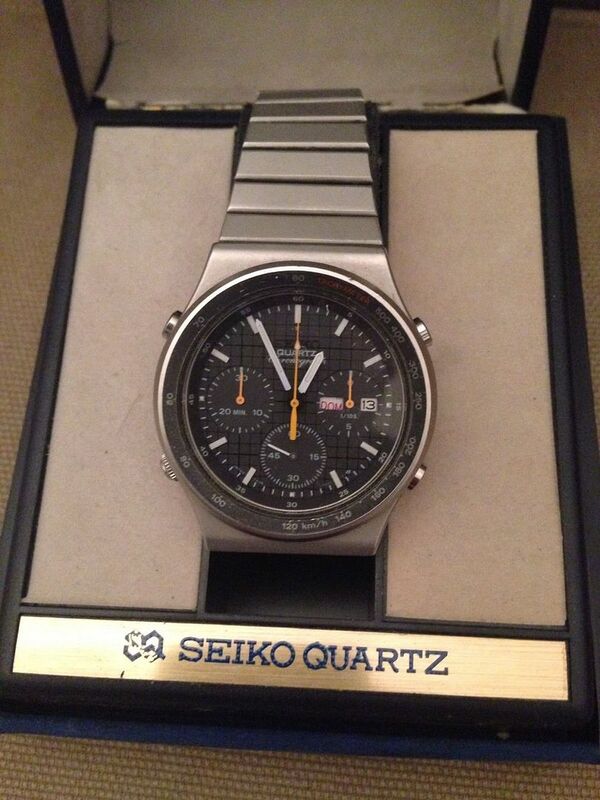 I suspect Seiko USA will be in a similar position. 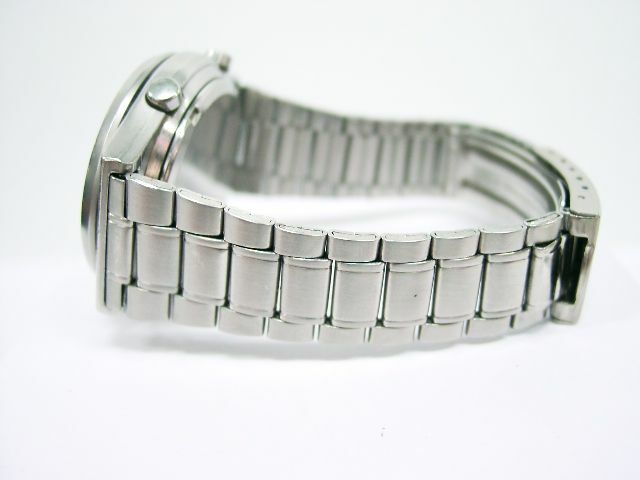 There are a few similar designed bracelets with 20mm fitment like Seiko p/n's B1424S, B1688S and G1410S, but none of them have exactly the same link section or that silver anodized finish of the original. 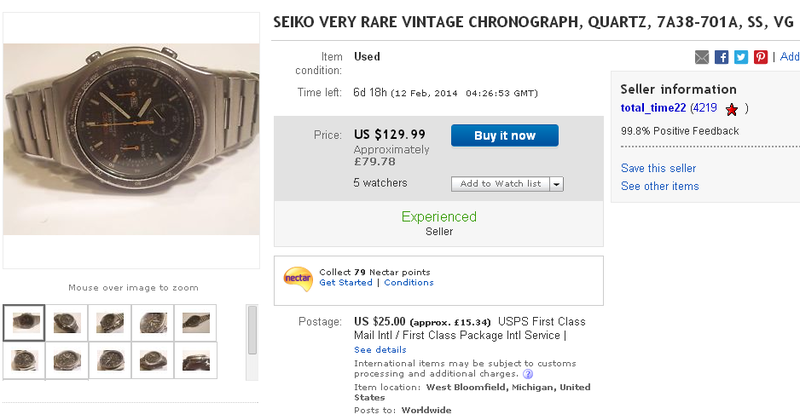 Again your chances of finding even one of those are pretty remote nowadays - any that appear on eBay are quickly snapped up by collectors for use as substitutes on 7A38-701x's. 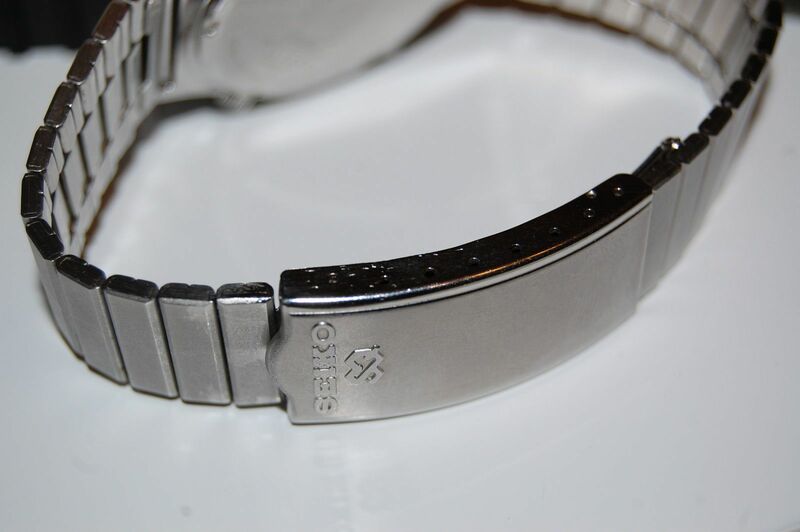 I would have suggested a Feiko aftermarket bracelet, but I guess you've already dismissed those. 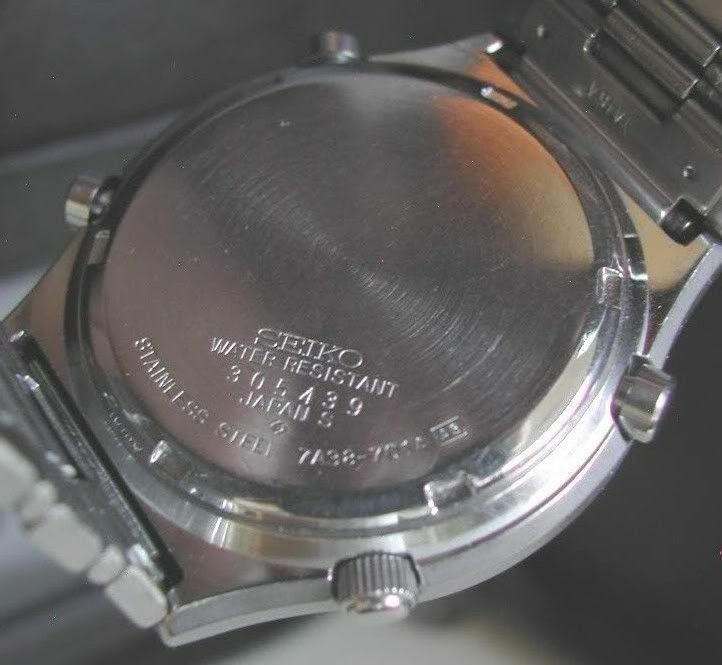 Don't know if you've seen this thread, but a forum member recently fitted one to a 7A38-701B. Serien Nr. 306374 Herstellungsland Japan. 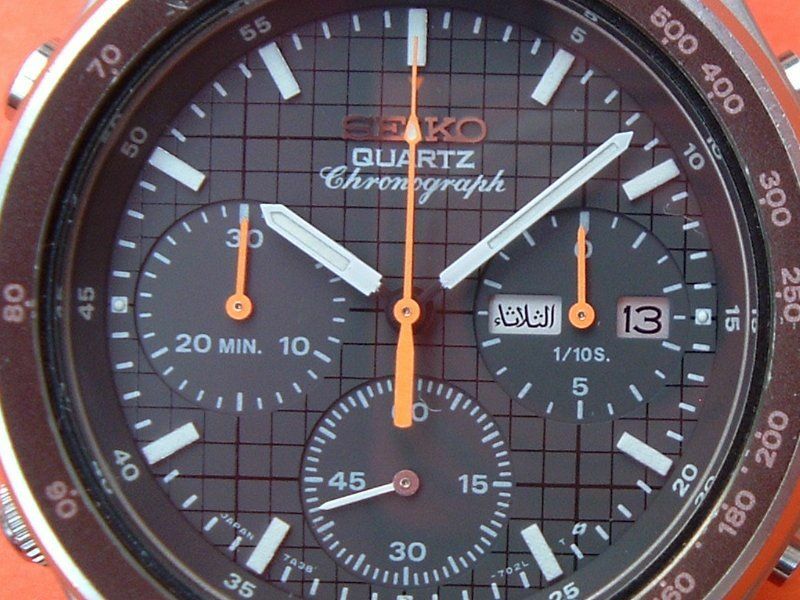 Tages und Datumanzeige Stoppuhr usw. 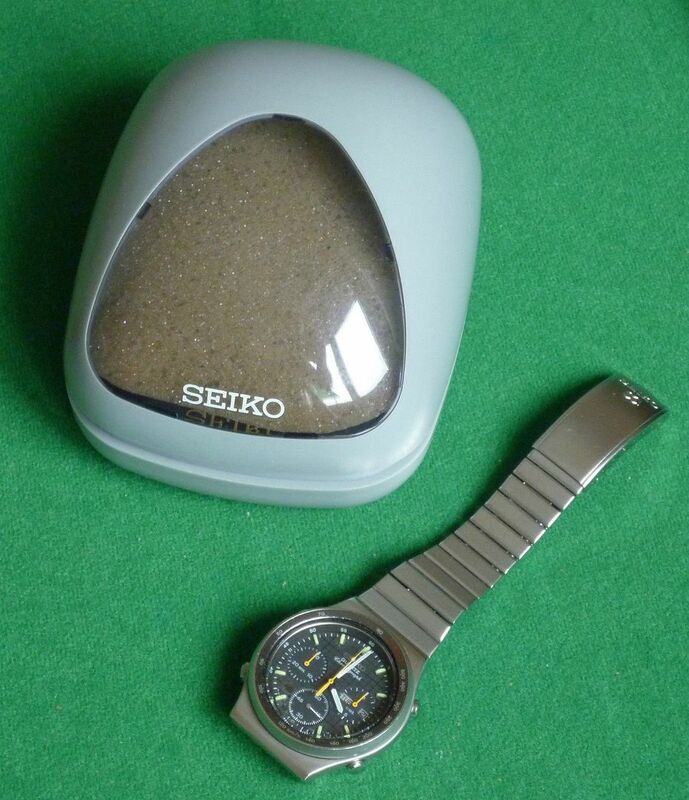 Original Seiko Armband in einem Glied gelöst. 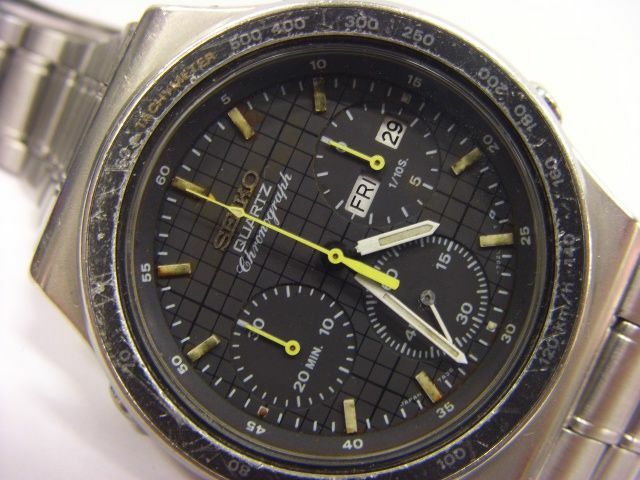 Badly scratched bezel inlay, the usual faded chrono' hands and slightly stretched bracelet, but other than that it looks all original. 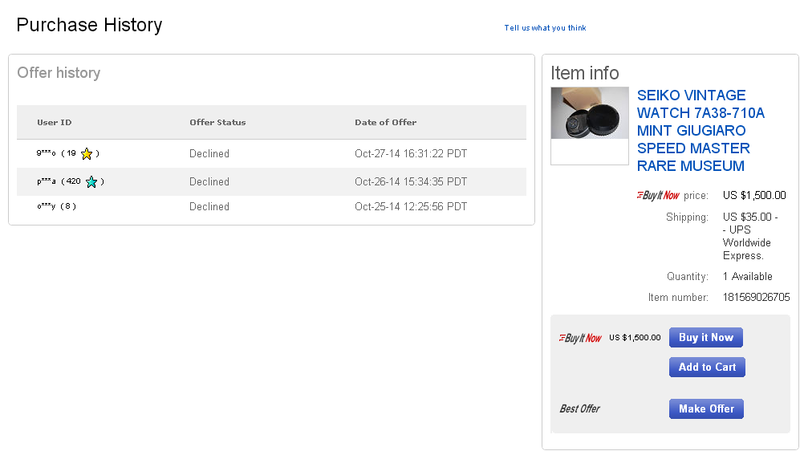 The auction ended yesterday evening around 8:30pm. 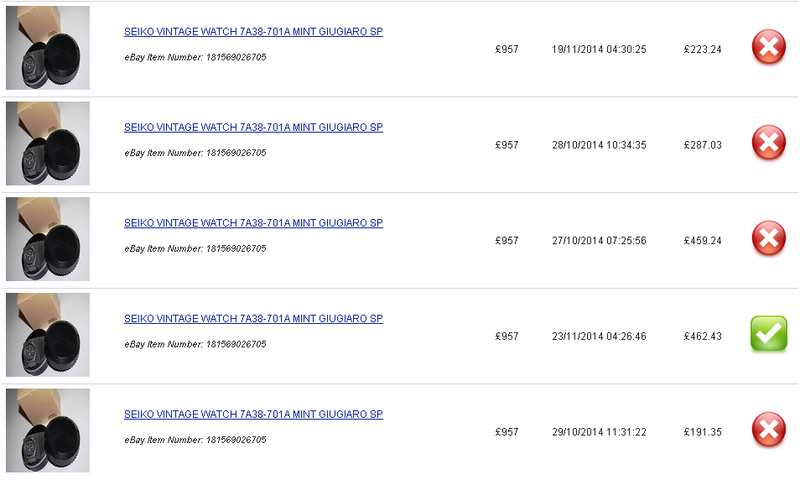 There was only one bidder - a forum member who'd bid on it on Day #1. 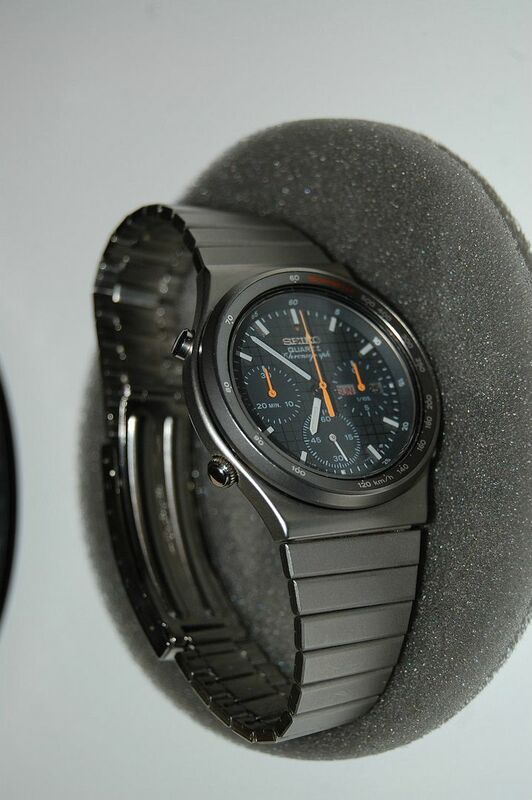 I suspect this potentially somewhat better example, listed on eBay Italy a couple of days ago, may attract rather more attention, despite the seller's unfortunate mistake in the model number. 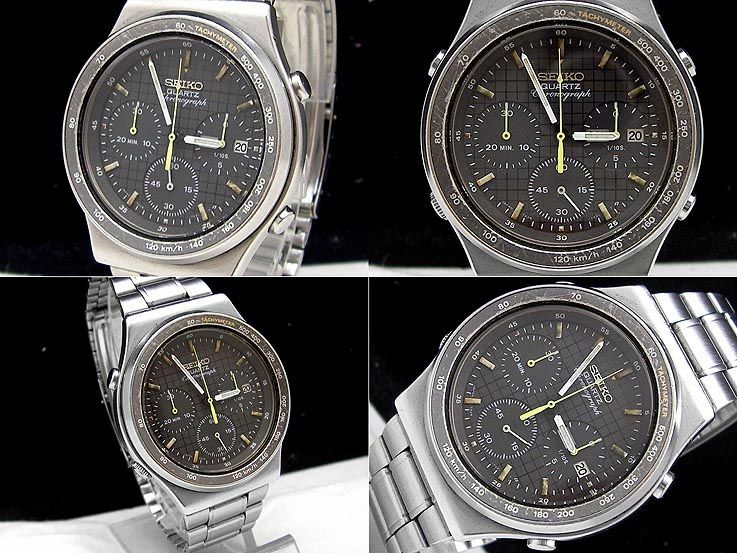 Should you be watching that Italian eBay auction for a 7A38-701A, you'll see it's turning into a pretty blatant example of shill bidding. 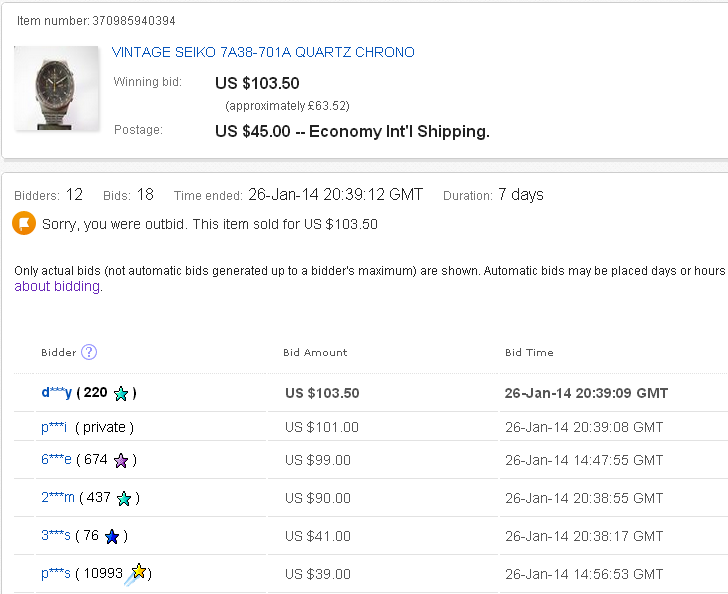 69 of the 76 bids placed so far are by p***a (11) who has 100% activity with the seller. It's 1:25am Pacific. 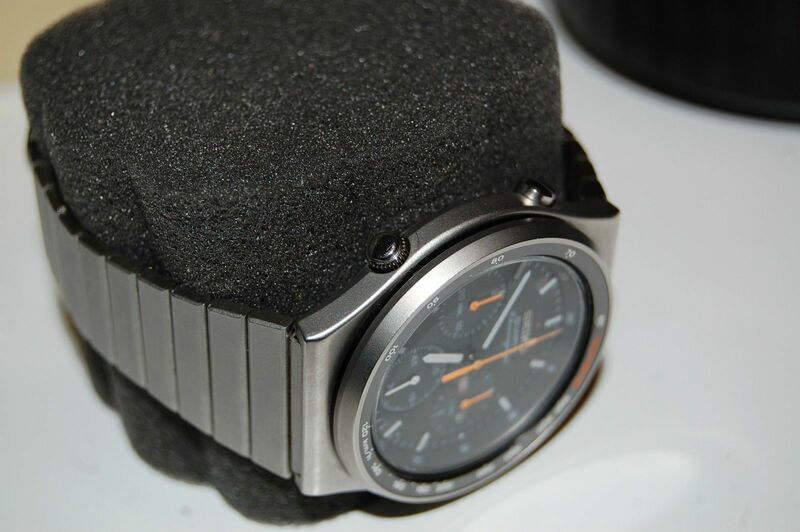 6hrs 6min to go and 198 Bids so far! 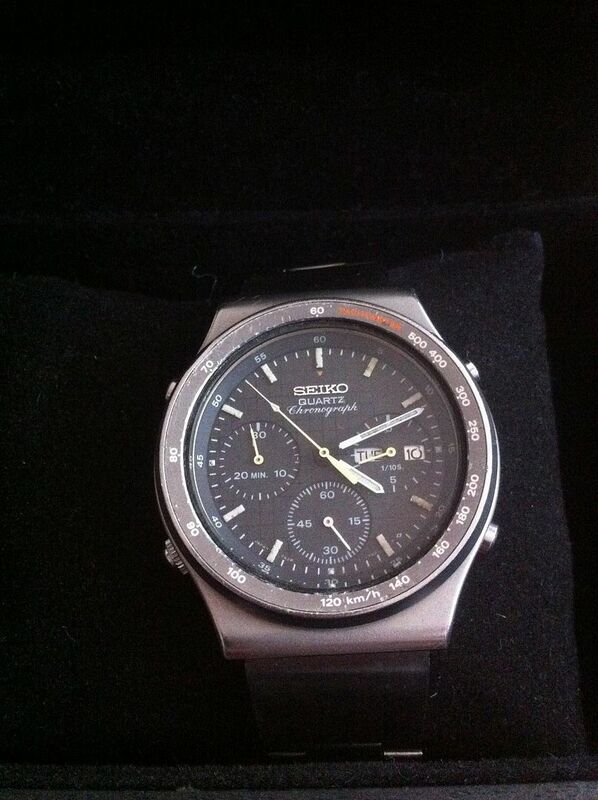 The bid is up to $453.31US (€401.00). 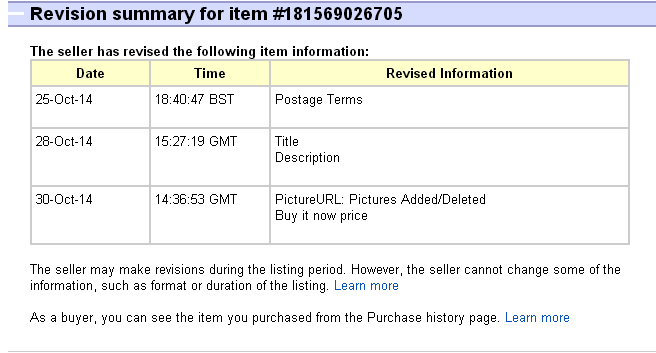 And this bidder is in the lead: p***a( 11) 89% feedback. 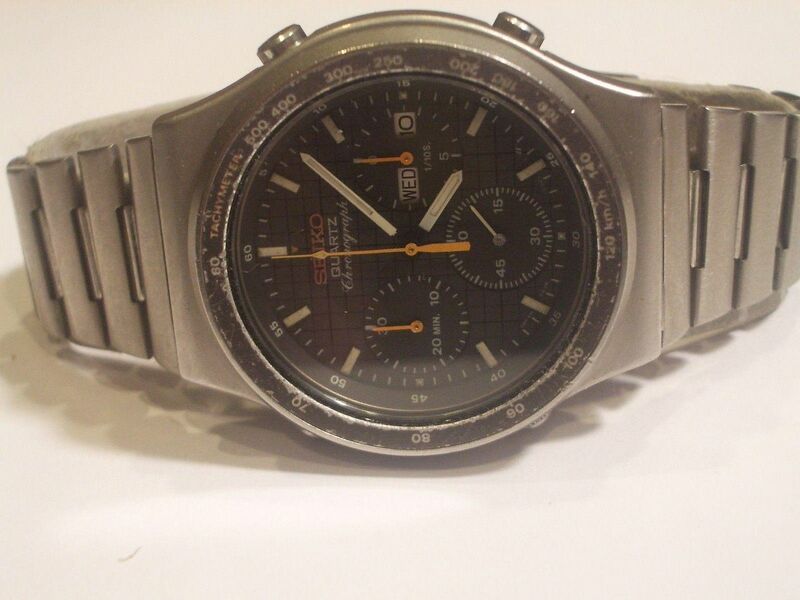 EUR 401.00 Feb-11-15 19:29:04 PST with 173 bids! The slight difference being that was after 'only' 26 bids. 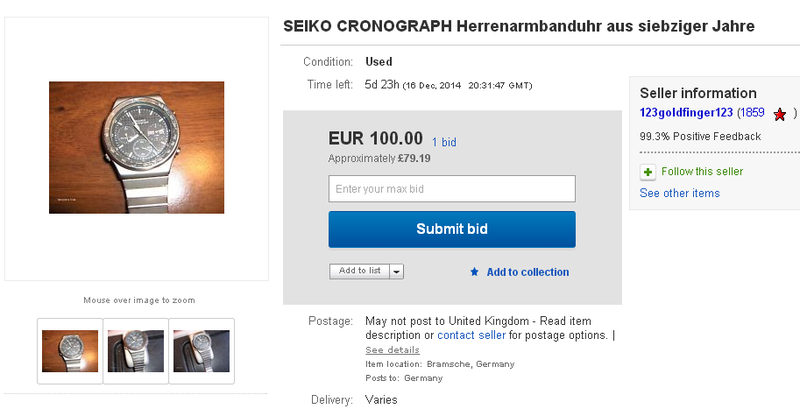 It would appear that the seller conveniently cancelled all 173 bids placed by shill bidder p***a (the highest of which was 430 Euros) about an hour and half before the auction ended. One of the most blantant cases of shill bidding I have ever seen. 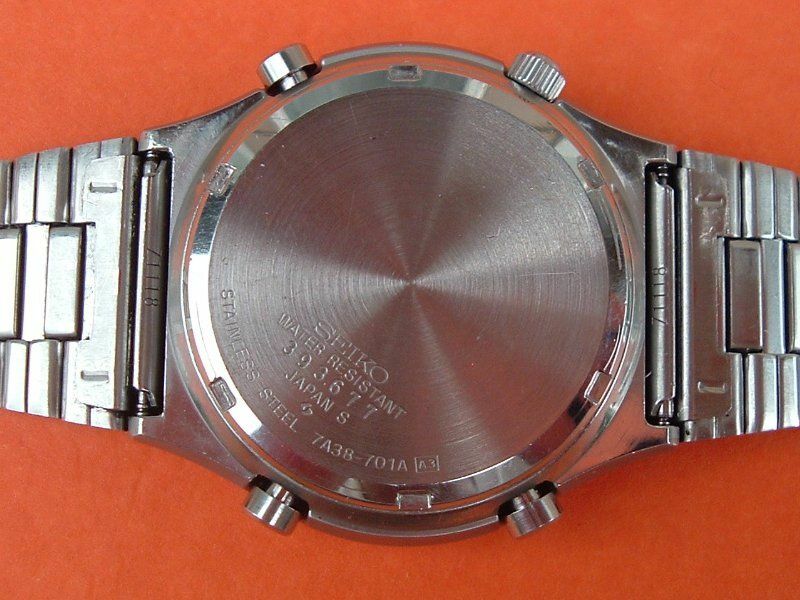 This 'spares or repair' 7A38-701A, fitted with a non-original replacement bracelet, was listed earlier today by a Romanian eBay seller. HELLO. 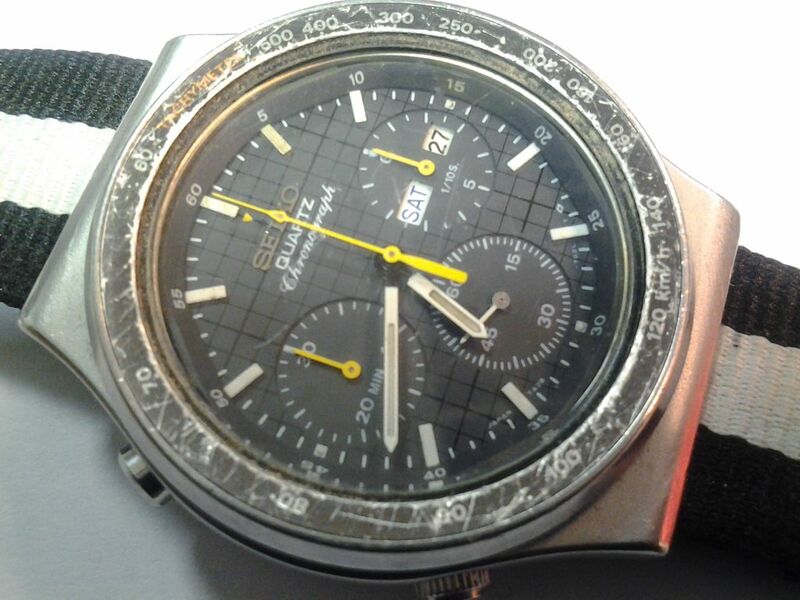 AN AUCTION THIS RARE CHRONOGRAPH SEIKO 7A38 701A ,15 JEWELS,JAPAN MADE.THE WATCH IS IN FUNCTION BUT THE CHRONO NEEDS TO REPAIR. 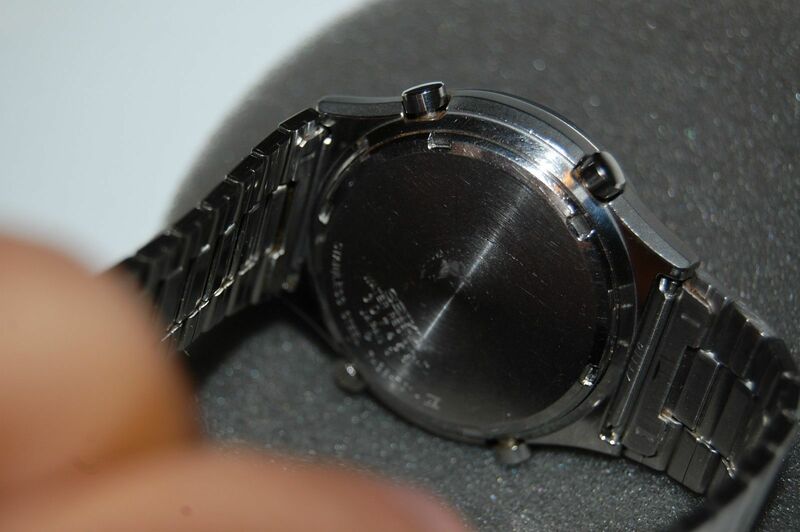 WITH MARKS IN THE CASE AND THE CRYSTAL.SEE THE PHOTO. 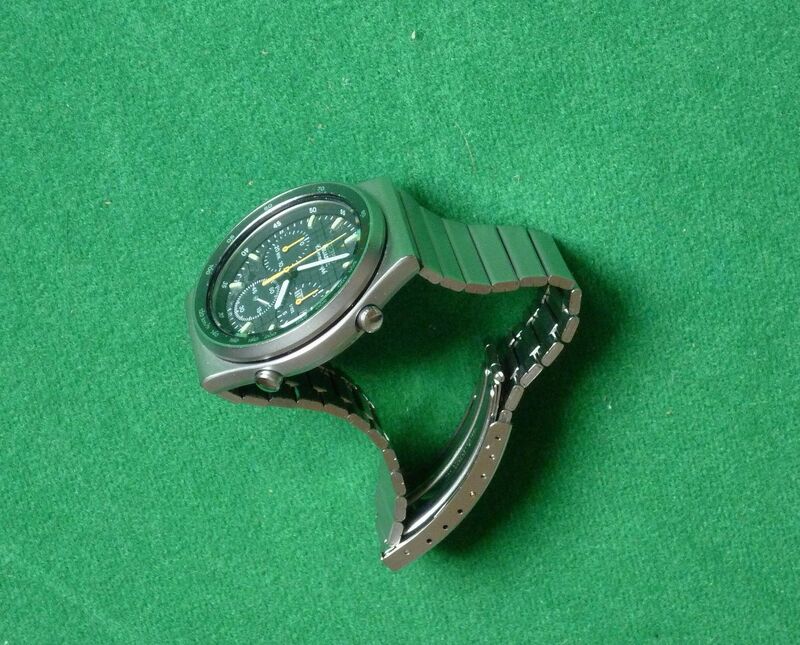 SELL FOR REPAIR OR PARTS.THANKS. 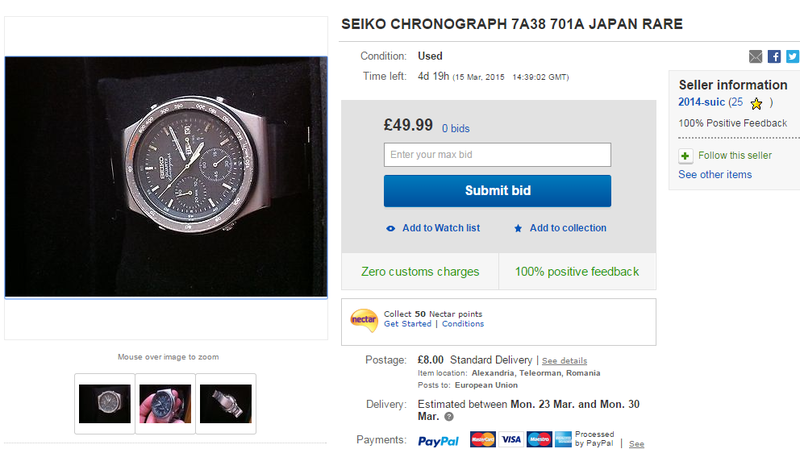 Crikey I wish I'd have seen that, somebody got themselves a bargain. 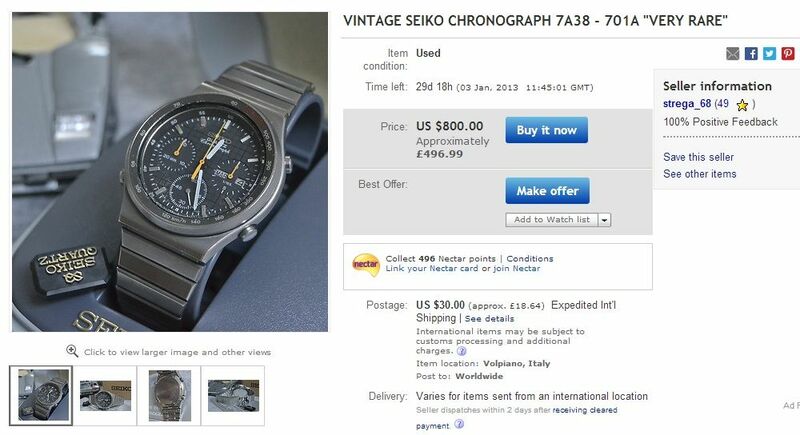 This 7A38-701A listed earlier this evening by an Italian eBay seller may not be quite such a bargain. 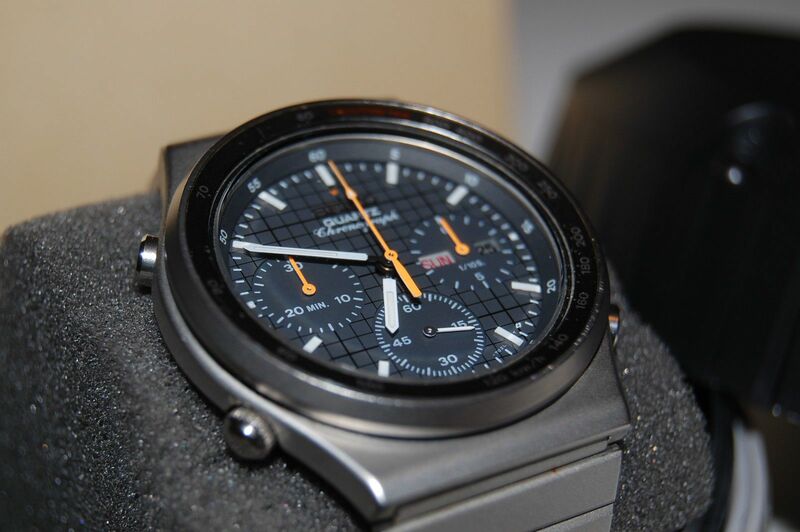 As soon as I saw the seller's ID areasettanta and Buy-it-now asking price of 390 Euros, it rang a bell. It took a couple of seconds to for the penny to drop, but then I remembered the Sport Tech style presentation box and the green beize background - and it clicked. 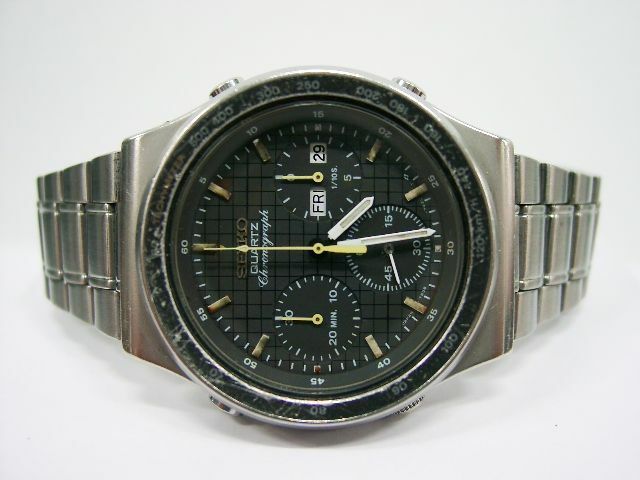 This is the same seller who listed a mint-ish stainless 7A38-7000 just over a week ago, which sold within a couple of hours - against a best offer. I wonder how long this listing will last. 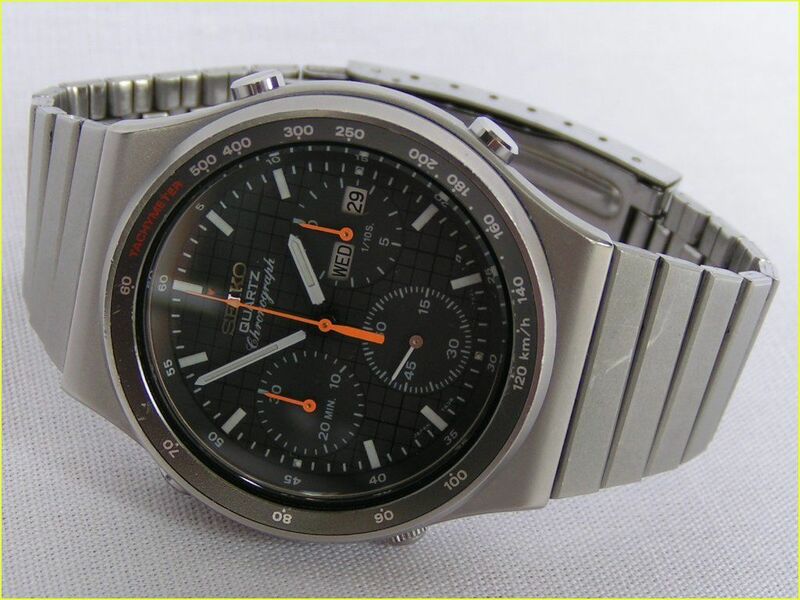 Bellissimo Seiko 7A38-701A dei primi anni 80 100% originale, mai lucidato con le sue finiture originali, in ottime condizioni estetiche e di funzionamento. 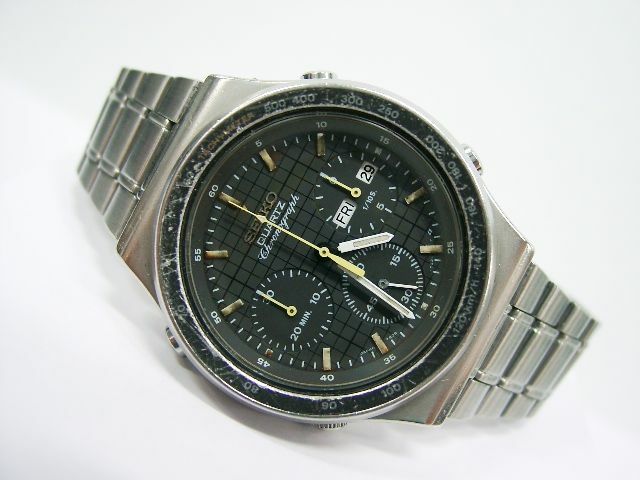 Questo orologio è equipaggiato con il Seiko 7a38, il primo cronografo analogico al quarzo del mondo, e soprattutto il migliore in assoluto, un capolavoro! 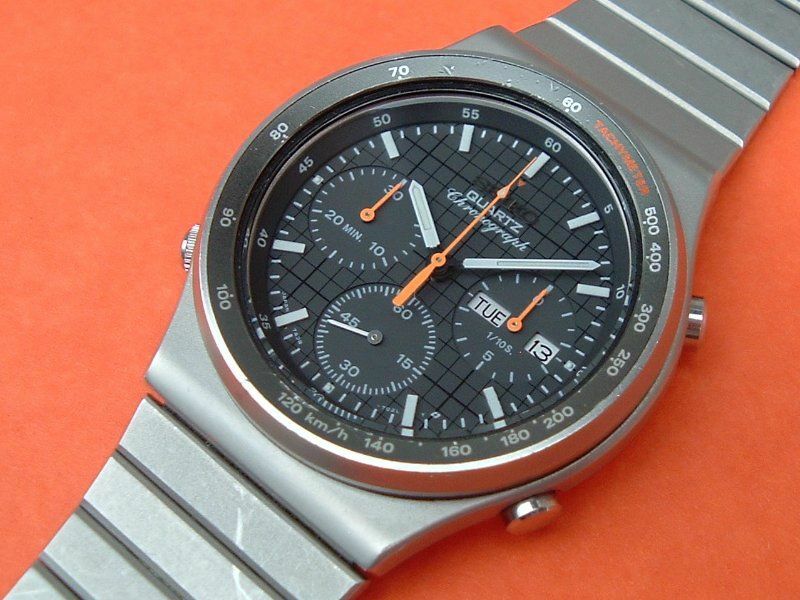 Il bellissimo design sportivo elaborato in collaborazione con Giorgietto Giugiaro ha contribuito ad aggiungere un tocco di classe e sportività ad una linea di cronografi che tecnologicamente parlando, all'epoca non aveva rivali, ed era quanto di meglio in circolazione! 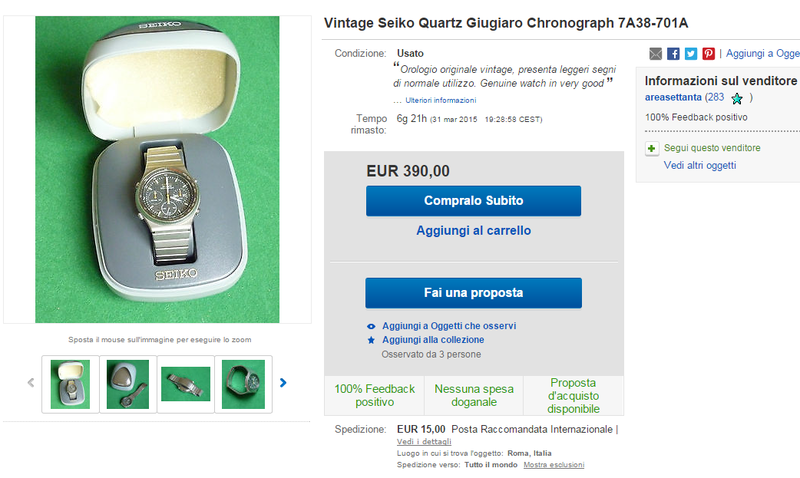 Un classico dei cronografi al quarzo vintage di qualità. Esaminate attentamente le fotografie, in quanto sono parte integrante della descrizione. Si vende con clausola visto e piaciuto. 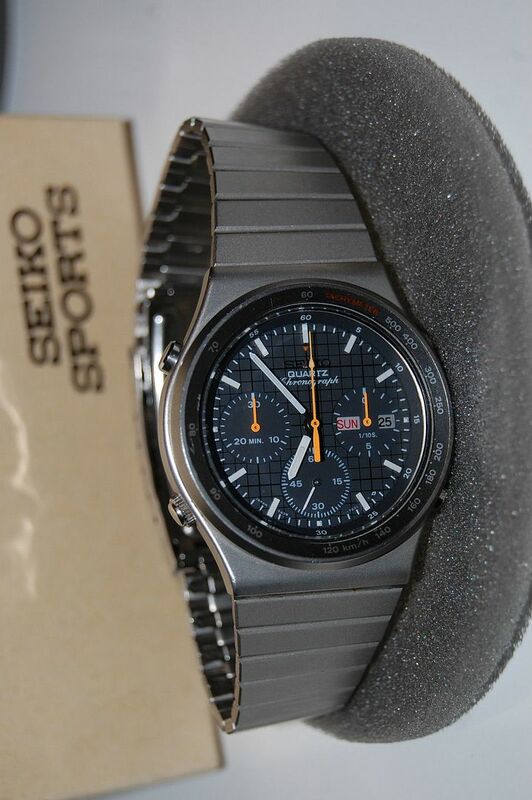 Stunning Seiko 7A38-701A of the early 80s 100% genuine, in very good conditions, everything works perfectly. 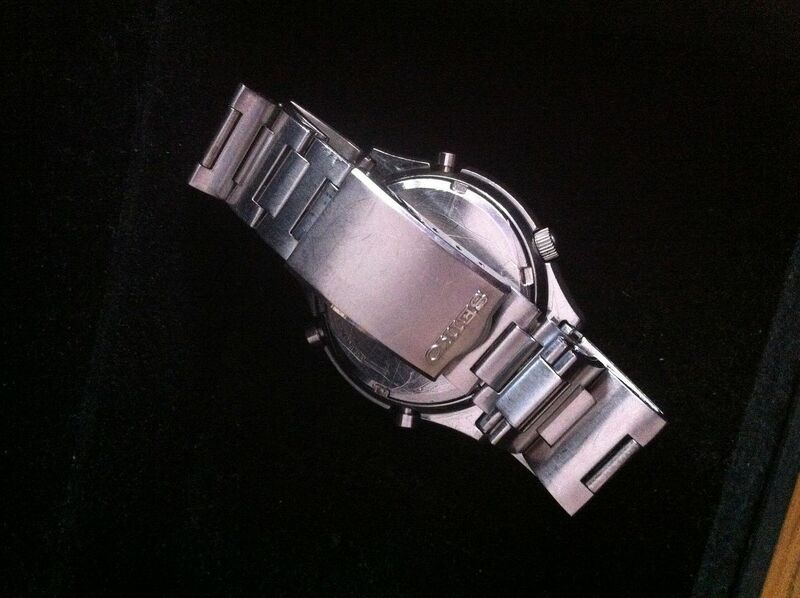 Watch never refurbished, it has it's original finish. 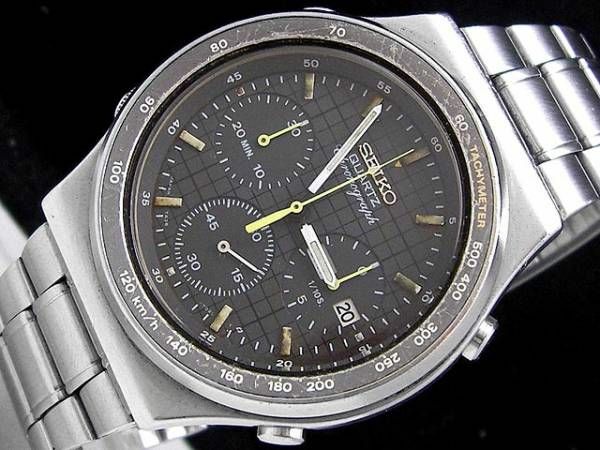 This watch is equipped with the Seiko 7a38, the first quartz chronograph in the world, and the very best, a masterpiece! 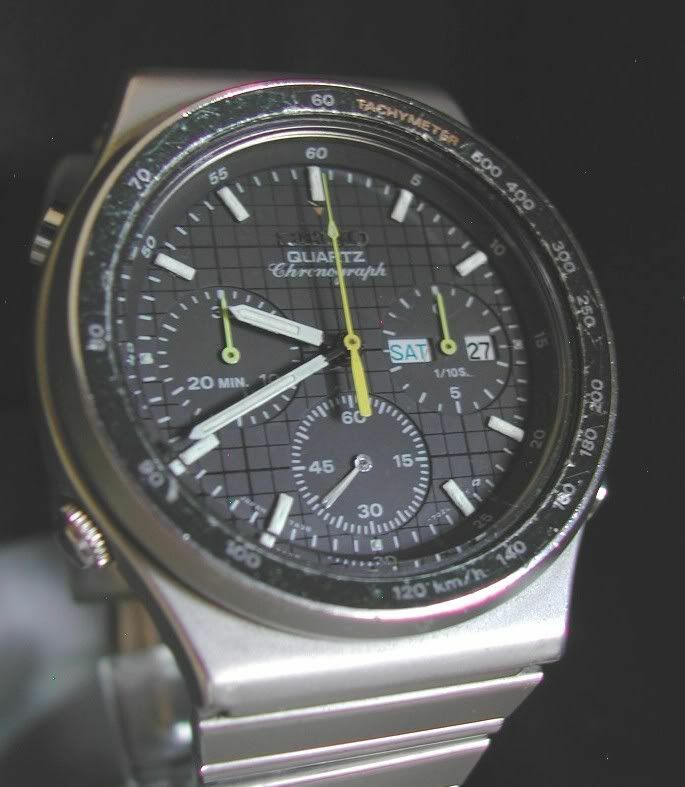 The beautiful design elaborate in partnership with Giorgietto Giugiaro contribute to add class and sportsmanship to the most tecnological well crafted quartz chronographs that was in circulation at the time! 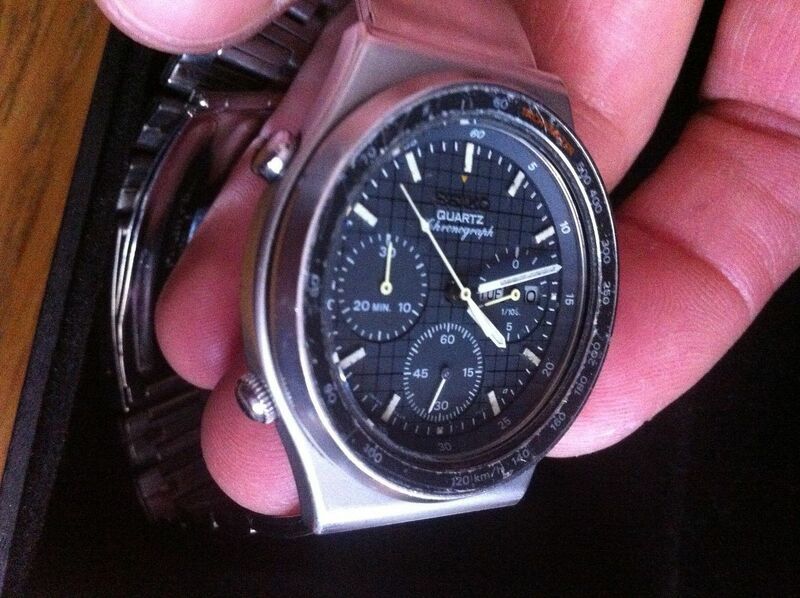 A classic timepeace of the vintage high grade quarts analogic chronograps. Please look carefully to the pictures, they are an integral part of the description. 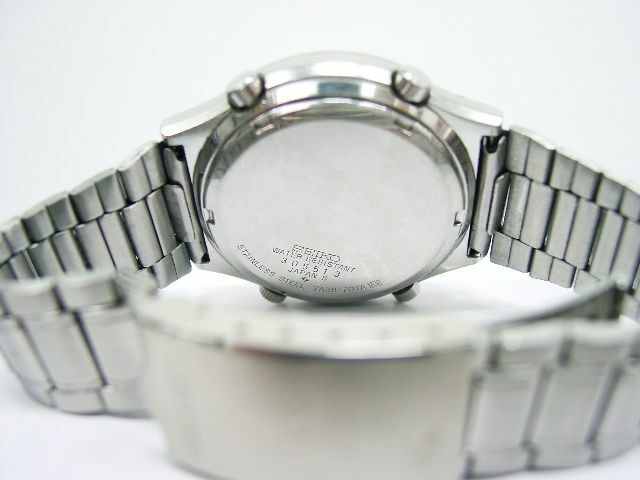 The watch is sold as is, no return.